An investigation has been launched into the outbreak of a mystery illness which has affected hundreds of school pupils. Almost half of the 990 attending Thurso High School in Caithness were off sick, after suffering flu-like symptoms. Another 155 from Wick High School, which has a roll of 850, have also been struck down with the bug, along with 20 pupils at Wick's Watten Primary school. Highland Council has called in public health experts, who were examining swabs to try to identify the infection. Reported symptoms have included sore throats, high temperatures, headaches and coughing. Dr Eric Baijal, director of public health medicine at NHS Highland, said: "This is the time of year that there is an increased incidence of viral infections of this sort. "There are sporadic outbreaks which can be quite large in various parts of the Highlands. "Flu-like viruses are liable to be self-limiting and investigations are being made to identify the cause of the illness." Helen MacDonald, infection control nurse at the health authority, said the swab results would not be available until next week. "In the meantime, we are continuing to monitor the situation," she added. Gordon Fyffe, spokesman at Highland Council, said: "We have alerted the public health experts to the high rates of absenteeism, and GPs in the area have been collecting samples for analysis. "While very high proportion of pupils at Thurso High School have been affected, we are only aware of one staff member being ill."
He added that there were no plans at present to close any of the schools. John Inkster, the rector at Thurso High School, said: "I have been here for 16 years and I have never seen anything like this. "Generally at this time of year we do see pupils affected by flu-like illnesses, but not in such high numbers. 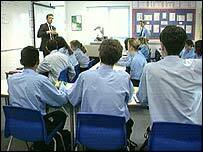 "It seems to be affecting mainly the younger pupils. "Hopefully the situation will improve by the start of next week."